Gocco of War on the Playism Store | Bringing a different breed of indie game to the world. This is "Gocco Studio Japan", an attraction where the children of 100 years from now gather! Create a cute avatar, equip them with your favorite weapon and stylish outfit, and join in an imaginary adventure come to life! Gocco of War is a light action/shooter that 1-4 players can enjoy. Progress through the game by beating quests as you play imaginary war, sword fighting and heroic adventuring. Environments and enemy variations are adapted to each quest. Want a change of clothes? Collect materials on a quest and combine them to make new costumes, upgrade your weapons and apply elemental properties for future quests. If you are awarded with a badge, stick it on for an extra status boost! Let's impress everyone by getting stylish and super strong! The P2P online lobby can hold over 30 people, with communication via text chat and avatar gestures! Let's make new friends who will come and fight with us. Shooting titles from abroad like FPS and TPS have incredibly tight systems and gorgeous visuals, at a level we cannot put out ourselves. I thought we could at least make an indie action/shooting game suited to Japanese aesthetics. A shooting game that can be fun without elements such as reloading/acquiring ammo. Gameplay that is exhilarating, without using expressions of violence. A camera perspective that make it easier to have a bond with your character. Faced with many uncertainties, we took our chosen elements and through much repetition of trial and error, this game was born. It's an indie game about children helping people, in a world 100 years from now where everyday life is much the same as it is now. The children live life to the fullest, and we hope being in contact with them will bring a smile to your face. If we are able to inspire a sense of positivity and courage through this game, not only to adult gamers but also children from around the world, nothing would bring us any greater happiness. Open the communication menu to choose a greeting. You can interact with other players using gestures!Share your feelings easily using set phrases. Press "Enter" for text chat with lobby members. You’ll come across Material Items while defeating monsters and exploring the field. If you finish a quest you can take Material Items you gathered back to the lobby in your quest pouch. At the Synthesis Shop, move your items into the material box to be used for creating and enhancing items! After finishing a quest, you could be awarded several badges selected at random. (sometimes none are awarded) Badges with a high rank will raise your abilities while equipped. To equip a badge, select it from the personal menu. The maximum number of badges you can equip depends on the costume you are wearing. Want more weapons? You can buy them at the shop. You can also enhance them with Material Items at the Synthesis Shop. As your enhance exp. increases, your weapons level up and become even more powerful. Enhancing with certain materials will give your weapon elemental properties such as fire! Elemental weapons will help you defeat monsters with ease. Changing the difficulty setting will change the frequency of money that can be found in a quest. Money is used for synthesizing, enhancing and buying items, so there’s no harm in picking it up! For beginners, we recommend starting offline on easy mode. More difficulty settings can be unlocked, but the enemies will become stronger. If you get stuck, try enhancing your weapons, increasing badge status and recruiting team mates online. The difficulty setting will impact the frequency of Material Items and the chance of obtaining a high rank. DirectX11 compatibility is required as a minimal system requirement. It is also necessary to have DirectX11's X3DAudio1_7.dll installed before startup. If an error occurs upon startup, please try installing DirectX end user runtime Web installer and try again. 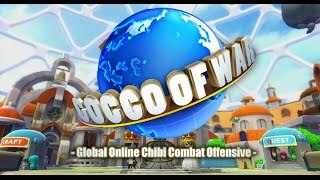 What do you think about Gocco of War? peakvox is an original label founded by O-TWO inc. We're a passionate group producing original games from Osaka to the world.